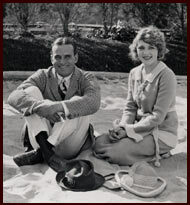 Throughout the 1920s, the hot love story in pre-Depression America was the union of two of Hollywood’s brightest stars, Mary Pickford and Douglas Fairbanks. Although it is unlikely that either ever set foot in Old Town Auburn, California, there is a unique link between this luminous couple and a seedy little tin-horn bar called the “Union Saloon,” a watering hole that occupied the building now home to Carpe Vino. Although many bars had operated in this space, by the time the Depression hammered the country in 1929, Old Town Auburn had already deteriorated into a sleazy skid row with most reputable businesses having relocated to “Upper Town.” It’s fairly certain the Union Saloon building was vacant at that point and was rarely occupied through the 1970s. And that’s likely the reason why “America’s Sweetheart,” Mary Pickford, was able to buy the period bar from the Union Saloon as a gift for the love of her life, silent-screen star Douglas Fairbanks. The fact that Mary Pickford made the purchase when she did in 1932 is rather remarkable, however, since her 12-year marriage to Fairbanks was near collapse. Pickford met Fairbanks at a party in 1915 when they were both married to others. Their relationship bloomed, and by 1917 they were secret lovers who stole time whenever possible. During WWI, they campaigned together to sell war bonds, and in 1919 joined with Charlie Chaplin and legendary director D.W. Griffith to form United Artists, the first film production company owned by performers. Fairbanks was divorced in the fall of 1918, but it wasn’t until March 1, 1920, that Pickford secured a Nevada divorce from her husband Owen Moore, who only let her go after she agreed to pay him a large cash settlement. Barely four weeks later on March 28, Fairbanks and Pickford were married at the home of a Baptist minister in Glendale, California. Pre and post-nuptial celebrations were held at what soon became known as Pickfair, a 42-room refurbished hunting lodge that Fairbanks, 36, presented to his bride, 26, as a wedding gift. It was the first celebrity mansion in a budding community of 672 residents known as Beverly Hills. Neighbors would soon include Charlie Chaplin, John Barrymore and Rudolph Valentino. Pickfair, an obvious combination of both last names coined by a newspaper reporter, became the entertainment center for the fledgling movie-making community of Hollywood. With a giant swimming pool replete with sandy beach, lagoons for boating and stables with 20 acres for riding, there was no shortage of recreation. The golden age of Pickfair was sweet but short-lived. By 1928, this idyllic hideaway was the scene of growing strife between Hollywood’s leading couple. Mary’s mother died, and she was devastated by the loss, since her mother had been central to her acting career which began in her childhood. At the same time, while she had always played the role of an innocent child with beautiful flowing blond curls–even as an adult–she desperately sought to create a new identity and persona. In an act of “personal liberation” that was viewed by her fans and her husband as lunacy, she went to a salon in New York City and had her life-long tresses shorn. With less than five years remaining in her movie career, she sought out roles in which she played an adult. One of her first choices was to star with Fairbanks in their only film together, “The Taming of the Shrew,” released in 1929 just as the financial markets crashed at the onset of the Great Depression. Their relationship was already stressed because she suspected Fairbanks of infidelity; he was put off by her unwillingness to travel with him, her unpredictable mood swings and what many believe was a problem with alcohol. The movie was a flop, which strained the marriage even more. By 1932, Fairbanks’ travels abroad without Pickford became more frequent, and it was obvious he was using his absence as an opportunity to cultivate other relationships. Still, their bond was strong, and reconciliation followed reconciliation. That year, the couple decided to make a substantial addition to Pickfair in order to accommodate a large influx of visitors anticipated during the 1932 Olympic Games being held in Los Angeles. After the games, Fairbanks left for an extended hunting trip that took him to Nepal in pursuit of Giant Panda. It is here that we circle back to Old Town Auburn. Part of the expansion at Pickfair probably included turning the basement into an extra space for entertaining, though it was not complete for lack of one key element: an authentic western bar, the acquisition of which seems inconsistent with the lifestyle at Pickfair. Douglas Fairbanks drank infrequently because of a promise made to his mother who suffered through a marriage with an alcoholic husband who ultimately deserted the family. Fairbanks agreed not to drink until he reached the age of 40. And, in fact, there was little alcohol ever served at Pickfair. One visitor to the estate observed, “We’d go there all dressed up and sit down at this huge table with the lovely dinner and servants falling all over themselves serving you, and not ever get one lousy drop of wine.” The only serious drinking to occur was done surreptitiously by Mary, who is said to have hidden spirits in cologne bottles in her dressing room. The drive to acquire a period bar stemmed from Fairbanks’ appreciation of western art. He was an avid collector of paintings by Frederic S. Remington and Charles M. Russell, and sought to create the proper environment for displaying them. An earlier quest to acquire a bar in Arizona met with failure. It was Mary who realized her husband’s dream by hiring two pioneers to scour California in search of a western bar for the basement of Pickfair. Their search ended at the Union Saloon in Old Town Auburn. The sumptuous bar was constructed of mahogany, about 16 feet in length, with three raised panels and four round columns with capitals. A brass rail ran across the top, and another served as a foot rail. The back bar was a symmetrical triumph, with a large mirror book ended by cabinets with double doors of beveled and art glass. Four fluted columns with intricate carved capitals supported the crown molding that completed the assemblage. To ensure no one missed the western theme, a set of giant horns from a Texas long-horn steer were mounted above the mirror. The bar was disassembled, crated and shipped to Pickfair where it was installed in the basement. According to a report in the December 31, 1932 edition of the Placer Herald, Mary gave the much-traveled bar, which was said to have been originally shipped around Cape Horn, to Douglas as a Christmas gift that year. The basement was designed to hold Fairbanks’ collection of antiques, books and other items, including a carbine rifle owned by Yginio Salazar, a Mexican gunfighter and part of Billy the Kid’s gang. My personal interest in the story behind the Western Bar, was piqued by a visit from a member of the Auburn Historical Society while I was working on the renovation of the interior of the old Union Saloon. I was told the story about Mary Pickford purchasing the original bar, and within a few days, I was on the hunt to try and determine the authenticity of the tale. After reading this, I contacted Mr. Cushman and he was gracious enough to search the Academy’s photo archives and produced two photos of the Western Bar. Remarkably, the Academy photographed the entire house and all of its contents shortly after Mary passed away in 1979. 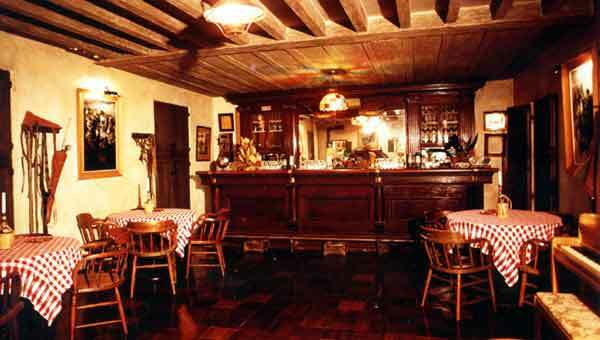 With the photographs as a guide, Master Bar Builder Cecil Saunders of Grass Valley, California, crafted a replica of the Western Bar about two-thirds the size of the original to serve as a tasting bar for Carpe Vino. 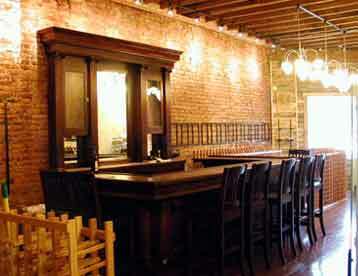 Saunders has been building bars for 40 years, including the bar in the tasting room of Indian Springs Vineyard in Nevada City, California. The interior of Carpe Vino has been renovated in sensitivity to the original structure, though we had no definitive record to guide our work. The plaster ceiling was removed, revealing 25-foot, full-dimension, Douglas fir beams studded with hundreds of hand-forged, squared-headed nails. We also exposed the original brick walls and the Douglas fir strip flooring, badly worn by the footsteps of tipplers starting 150 years ago. The centerpiece, however, is our gorgeous 12-foot wide Mary Pickford bar, about two-thirds the size of the original. 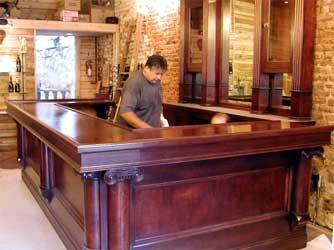 The bar top is mahogany and the rest is constructed of alder, finished in a deep, rich color. Most of the original architectural features have been retained, though we did not spec brass or art glass windows because of the prohibitive cost. My personal preference would have been to try and find the original bar, but there is no trace of it to be found. Pickfair was purchased in 1988 by wannabe movie actress Pia Zadora and her billionaire husband, Meshulam Riklis. Supposedly, the building was severely damaged by termites, but one wonders how badly Pia wanted to have a modern Italianate style home constructed on the site. Pickfair was razed in 1993, and there is no evidence of what happened to the original Western Bar. It was a bitter ending for the Pickford/Fairbanks union as well. The couple split in 1933, with their divorce coming on March 1, 1936. Two months later, Fairbanks married Sylvia Hawkes, 20 years his junior. He died suddenly of heart failure on December 12, 1939 at the age of just 56, still in excellent trim. Mary Pickford married her former leading man and orchestra leader, Buddy Rogers, in 1937. Rogers starred with her in 1927 in “My Best Girl,” and gave Mary her first on-screen kiss. The two apparently had a strong attachment and even a long-term affair according to several Pickford biographies. 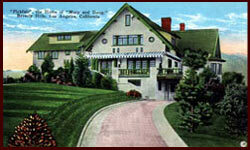 Pickfair remained Mary Pickford’s home until her death. From 1965 onward, she seldom left the estate, and for the most part preferred to remain in her bedroom, the same room she shared with Douglas Fairbanks during their idyllic years together.